Fig. 1. (a) Optical microscope image of four GaIn probes contacted with 1 ML pentacene. (b) Schematic of the electrical circuits. Fig. 2. Four-probe I−V curves (a) before and (b) after O2 exposure measured with the probe alignment shown in Figure 1(a). (c) and (d) Inverse of four-probe resistance 1/R4p as a function of gate to channel bias VGc1, respectively. 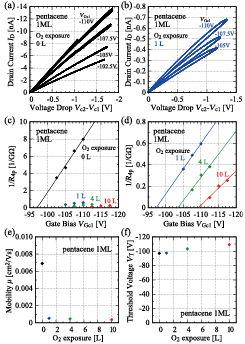 (e) Estimated mobility and (f) threshold voltage. The interactions of gaseous molecules with organic field effect transistors (OFETs) play a crucial role in the electronic transport property. Chemical interactions including oxidization are a serious issue for degradation of long-term stability of organic devices. Physical adsorption can also modify electronic states of OFETs. Gaseous molecules may diffuse into OFET film through defect sites such as grain boundaries, resulting in a change in the film structure and/or the formation of a gap state. Recently, we have developed the non-invasive liquid-metal GaIn four-probe measurement method for the FET properties of organic monolayer and thin films [1, 2]. In this Research Highlight, we report that the electrical transport property of monolayer pentacene is highly sensitive to a small amount of exposure to O2, N2 and Ar gases using independently-driven four GaIn probes . Liquid metal GaIn probes have been used as non-invasive conductivity electrodes for monolayer OFET films in a vacuum chamber (Fig. 1). We carried out the fabrication of monolayer pentacene and the four-probe measurement without exposure to atmospheric air. Four GaIn probes were used in situ to measure conductivity in the channel separately from the overall characteristics including contact resistance at the electrode probes . The experimental results show that O2 exposure of 1 L (10−6 Torr s) reduces mobility to 8% of the original value in the monolayer film, and the reduction is irreversible at room temperature, i.e., mobility does not recover its original value after the evacuation of gaseous molecules (Fig. 2). Since chemically inert gases of N2 and Ar also reduce the mobility, physisorption of gaseous molecules should be involved in these gas exposure effects. For a 3 ML pentacene film, O2 exposure also reduces its mobility, but the mobility is saturated at 70% of the original value between 10 L to O2 atmosphere. Thus, we assume that physical adsorption of gaseous molecules is important for the initial gas exposure effects, because chemically inert gases of N2 and Ar also reduced the mobility in monolayer pentacene. Taking these findings together with the results of photoelectron spectroscopy and atomic force microscopy measurements, the reduction in mobility can be attributed to the physisorption of gases at grain boundaries formed by the coalescence of pentacene monolayer islands . S. Yoshimoto, K. Takahashi, M. Suzuki, H. Yamada, R. Miyahara, K. Mukai, and J. Yoshinobu, Appl. Phys. Lett. 111, 073301 (2017). 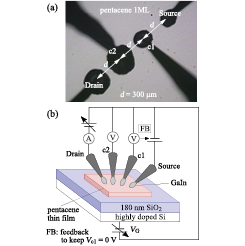 S. Yoshimoto, R. Miyahara, Y. Yoshikura, J. Tang, K. Mukai, and J. Yoshinobu, Organic Electronics 54, 34 (2018). S. Yoshimoto, T. Tsutsui, K. Mukai, and J.Yoshinobu, Rev. Sci. Instrum. 82, 093902 (2011).